Niagara Region's Elementary Waste Management Education Programs provide the opportunity for students to learn about Niagara's curbside Recycling and Green Bin programs through fun and interactive approach. Enjoy learning about waste diversion using the 3R's (Reduce, Reuse and Recycle). Niagara Region offers presentations in assembly style or catered to specific grade levels/curriculum for primary, junior and intermediate grades. Presentations are also available for high schools. Campers learn about the importance of 'Reducing, Reusing, Recycling and Composting' while having fun participating in themed activities for two different age groups, (preschool - age 7 and ages 8 - 13). Each presentation engages children in interactive lessons, active games and skill building activities to help them learn the practical knowledge of how and why to recycle. Community presentations focus on the importance of managing your waste using the three R's: Reduce, Reuse and Recycle. Each presentation reviews Niagara Region's Recycling and Green Bin programs, whiling touching on some other programs and services. Presentations can be delivered to adults or youth community members. The interactive approach will engage the audience in learning about our waste management programs, while staff help address any questions realted to. A representative from Niagara Region will be in contact with you to confirm your presentation. Each presentation provides students of all ages the basic skills and knowledge of recycling in Niagara including a discussion on the importance of the 3R's. Bus transportation is paid for by Niagara Recycling (subject to availability). Focuses on the importance of protecting our environment. Niagara Region's Recycling Programs are introduced at a basic level that encourages audience interaction through an interactive presentation, storybook and game. The children will also meet our mascots. Our adult community presentations discuss the importance of managing your waste. Our Recycling and Green Bin programs will be discussed in detail, highlighting some of the not so obvious waste items and how to sort them, followed by a question and answer period. Our youth community presentations focus on the importance of using the three R's: Reduce, Reuse and Recycle. 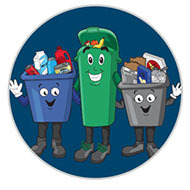 This presentation reviews Niagara Region's Recycling and Green Bin programs and includes an interactive recycling game and a visit from our mascots. Gather round Planeteers. Join us as we try to find out who has been littering and causing recycling problems around Niagara, as we learn how to use the Blue Box, Grey Box and Green Bin along the way. Once the litter culprit has been found, campers will participate in a group activity teaching them how to sort their waste by putting what they've learned into practice. Ever wanted to be an astronaut? How about a waste-tronaut? Campers will be put through various training modules to learn how to be a waste-tronaut, cleaning up space and learning how to use the Blue Box, Grey Box and Green Bin.